Loading zone for passengers or mail only. Loading zone for freight only. At a white painted curb, you may stop only long enough to pick up or drop off passengers or mail. Left, your right, then your left again. Before you enter an intersection, look to both the left and right for approaching vehicles or crossing pedestrians. Look to your left a second time, as vehicle approaching from your left will be closer than those approaching from your right. Look across the intersection before you start to move to make sure the path is clear all the way through. If you drive more slowly than 15 mph. If making a right turn, you may enter the bicycle lane no more than 200 feet before the corner or driveway. Drivers of motor vehicles should not enter a bicycle lane at any other time. 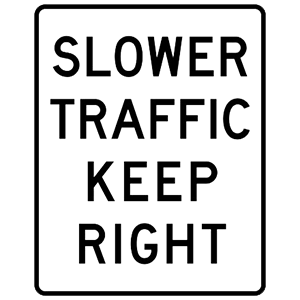 Stay in the right lane if you are driving more slowly than other traffic. Slower traffic must exit on the right. A white, rectangular sign indicates that you must obey important rules. 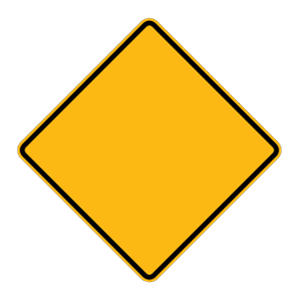 This sign means that drivers should allow the left lane to remain open, when possible, for passing and for faster traffic.